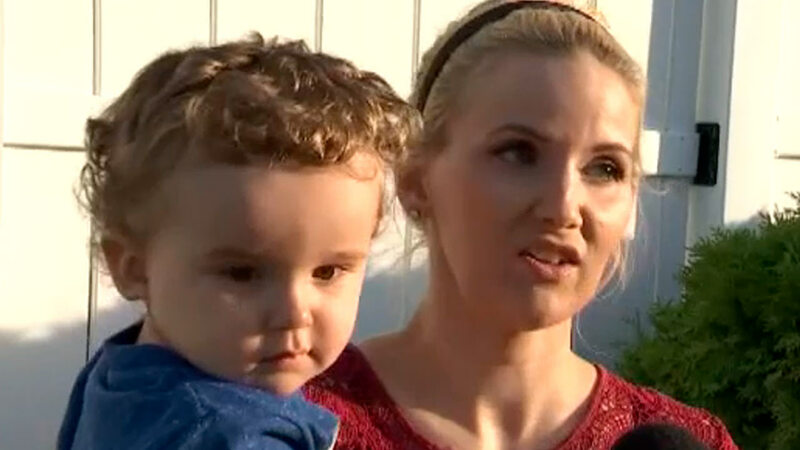 WATERFORD, Connecticut (WABC) -- A toddler in Connecticut was rescued after falling 12 feet down a ventilation shaft, and now, his mom hopes the experience serves as a warning to other parents. "I looked down, and I saw him in the vent," mom Kristie Mendes said. "I just couldn't breathe." Mendes described the worst moments of her life when her son had fallen down the air vent in their Waterford home. She said she had gone to the bathroom and left her son in a gated area of the hallway, but he somehow got the vent cover off and fell in. Mendes: "It's OK, baby, it's OK."
Dispatcher: "You can see him or just hear him?" Mendes: "Yes, I can see him, but only half of him. He's holding on." Fourteen-month-old Elijah Irizarry had fallen feet first through the narrow opening and dropped 12 feet from the second floor down to the basement, trapped in the very narrow duct work. "The baby was in a position where his hands were over his head, and he was in a position where he couldn't get them back down," said Tom Martin, of the Waterford Fire Department. "He was sandwiched from the front and from his backside and had room on the sides. His head was kind of pinned in there." More than a dozen responders cut through the duct work and got him out within 20 minutes. Luckily, he had only minor scrapes. "They did great, the first responders," Mendes said. "Everyone that came in and helped to get him out, they worked great as a team." Mendes thinks Irizarry used a hanger to lift off the vent cover. She said he had never done it before and always assumed the vent was screwed down. Mendes hopes it can be a teaching moment for all. "Out of all of this, to help people be aware that it can happen," she said. "And like I'm doing today, I'm getting all new gates and screwing them all down."